Hao Jingfang (born 1984) is a Chinese science fiction (SF) writer, essayist and economist residing in Beijing. An economics researcher by day, she is a talented and prolific author who writes in the early morning. Her fiction has appeared in English in SF magazines Lightspeed, Clarkesworld, and Uncanny. 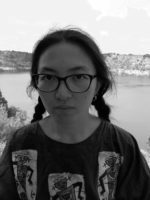 In 2016, her novelette, “Folding Beijing”, won the Hugo Award, the second translated Chinese SF work to have won that honour; the first being Liu Cixin’s The Three-Body Problem. “Folding Beijing” was a finalist for the most prestigious Chinese SF award, Chinese Xingyun (Nebula). The story will be adapted into a movie, directed by Korean American screenwriter Josh Kim. Jingfang is the author of two full-length novels, Born in 1984 (2016) and Stray Sky (2016), a book of cultural essays, Europe in Time (2012); and several short story collections, AI: Mirror of Man (2017), To Go the Distance (2016), The Depth of Loneliness (2016), and Star Travellers (2011). She is also the founder of WePlan, a public education project aimed at preparing China’s younger generation for the era of artificial intelligence. This interview focuses on Folding Beijing while shedding insights on the diversified terrain of Chinese SF in general. Emily Zong (EZ): Some readers’ online comments maintain that “Folding Beijing” is not “SF” enough. They claim that the story’s strong allusion to contemporary Chinese political and economic reality deviates from a more classical understanding of speculative fiction as a genre of scientific hypotheses and futuristic technologies. What is your response to such comments? Hao Jingfang (HJF): There have always been characterisations of hard SF that focus more on science and technology, and social or soft SF that primarily imagines life and social scenarios in the future. Take the American SF writer and the translator of “Folding Beijing”, Ken Liu, for example, he has written a number of acclaimed works on family life and office life. So of course, social SF has its significance in inspiring people’s vision of future life and social relations. Any type of SF writing, as long as it is able to impart fantasy and open up future possibilities, is valuable. Also, different readers have different tastes. It is impossible to meet everyone’s needs. Some people find hard SF intriguing, while others find it challenging to turn a second page. This is a matter of readers’ tastes. If some part of the audience enjoy my fiction and feel touched by it, I will be very pleased. EZ: Chinese SF is a burgeoning field within the contemporary Chinese literary scene. With you and Liu Cixin winning the Hugo Award, Chinese SF has also attracted a great deal of international attention. Now one of the provocative questions under discussion is what makes Chinese SF unique. What do you think makes Chinese SF Chinese? HJF: For me it mainly depends on the setting and the protagonist. If a story takes place in China, it is already a very Chinese story. I think that for a lot of people, upon hearing that this is a SF story that is set in China, they would immediately feel a sense of discordance. It is easy to associate SF with Western countries, Marvel Heroes, and white characters, but how could a SF story occur in China? If a story allows us to overcome this sense of disbelief and discordance, it would count as an excellent piece of Chinese SF. As long as the fictional events happen naturally within a Chinese setting and among Chinese characters, it would immerse readers in aspects of Chinese culture, even without the writer’s intentional assertion of Chinese elements. EZ: When SF was introduced to China from the West in the early 20th Century, it was equated with “modified modernity” and used as a vehicle for scientific enlightenment. This ideological and pragmatic tradition lasted until the 1990s when, with the emergence of a new generation of SF writers such as Liu Cixin, Han Song, Wang Jinkang, and yourself, Chinese SF started to manifest a more diversified vigour. Nevertheless, Han Song comments that Chinese SF is “a sponge soaked in politics” and “a diagram of Chinese mainstream culture.” “Folding Beijing” bears on a range of imminent social concerns in China from class inequality to abandoning female babies. Is this political and nationalist approach a distinct feature of contemporary Chinese SF? HJF: I think a distinct feature of contemporary Chinese SF is diversity, which resists politicisation. Chinese SF writers tend to engage with a broader range of thematic concerns than national and political themes. If Chinese SF has a colour, it is usually grey or black, rather than Chinese red. Chinese SF is a heterogeneous field where writers have variegated styles. With an exception of Wang Jinkang whose fiction is more political, writers such as Han Song, He Xi, Bao Shu, Chen Qiufan, Jiang Bo and so on, place more emphasis on individual writing practices and artistic expression than social trends. A fair number of Chinese SF writers provide readers with glimpses of the present Chinese society, especially young people’s daily anxieties and the social issues that penetrate people’s quotidian lives. But this does not mean that these works are necessarily political. “Folding Beijing” is not representative of Chinese SF. Actually, it is quite an exception in how it places an emphasis on Chinese social reality compared to most Chinese SF. EZ: What do you think of the international acclaim of “Folding Beijing”? HJF: Many people read and evaluate “Folding Beijing” in political terms, which is not what I intend it to be. It is my hope to have conversations with readers who approach the story as a piece of literary writing and readers who are intrigued by the scientific hypotheses embedded in my stories. EZ: Is “Folding Beijing” representative of your work? HJF: I would say, no. “Folding Beijing”, and my novel, Stray Sky, are exceptions among my own works that explore social issues. “Folding Beijing” does not represent my style. Most of my fiction centers upon the existence of human beings, including boundaries between reality and fiction, the ways that individuals perceive their existence and psyche, as well as the ways that human beings relate to the universe. My next novel, for instance, is going to interrogate how people relate to each other and the connection and conflicts among civilizations. I am more inclined to create fictional settings that diverge from the real world we live in and delve into the philosophical propositions underneath people’s outlook and beliefs. EZ: That is interesting. Considering that “Folding Beijing” won the Hugo Award, some readers and critics may learn about you and your work from this novelette alone. Also, when reading cross-culturally, audiences in the Western market may focus on distinguishing identifiable Chinese embodiments and “authentic” experiences as more significant than the existential or universal concerns in these works. It is not fair to give Chinese SF the “political” label. HJF: Reading politically is too narrow a perspective. For example, in my work readers should compare at least ten or twenty stories before arriving at an understanding of the overall style. Chinese SF is more heterogeneous and there are not many stories like “Folding Beijing” that reflects on Chinese social structures. Han Song engages with social issues in his novels, but his angle is more specific, such as probing into the institution of a hospital. Other Chinese SF presents a constellation of thematic and stylistic practices. Bao Shu, for instance, writes seven novels on the topic of time and time travel. Another writer, He Xi, has written a novel called Liu Dao Zhong Sheng, or Six Plane Rebirth, in which his characters travel across six parallel dimensions in order to save the world. The well-known Chinese SF novel, The Three-Body Problem by Liu Cixin, portrays shared challenges faced by the future of humanity. These novels address universal concerns for a common humanity that transcends politics and nations; such as the future of mankind, human-universe relationship, and human civilisations. We cannot pigeonhole Chinese SF into a political category. Moreover, the current era of China is full of diversity, fierce competition and unprecedented opportunities, which is conducive to the development of miscellaneous literary engagements. In such a context, Chinese SF is filled with multiplicity and potential. EZ: The ending of “Folding Beijing” is heart-wrenchingly peaceful and ironic. As Lao Dao returns to his position as a waste worker in the Third Space, his border crossing does not offer a cathartic sense of social reorganization. As the novel describes, “If he could see some things clearly but was still powerless to change them, what good did that do?” The revelation seems to rest upon keeping “the Change” itself. I wonder why did you not write some imaginative solution to change the enforced class stratification or the individual’s subordination to the collective? HJF: I tend not to write simplified solutions in novels. Can a single hero overthrowing the world solve a deep-seated social problem? It is way too naïve and downplays the hardships and pains we undergo in real life. Sometimes SF has dystopian endings. The literariness of a story does not depend upon its resemblance of reality, such that we have to pursue justice and dismantle injustice. Some types of fictional writing give people a sense of relief and elation, while other types make people see the cruelty of reality from a sharper angle. My works belong to the latter. The theory behind “Folding Beijing” is the quantum physics system Hamiltonian, or the collective energy of a system. If we take the megacity of Beijing as a system, the three Spaces in “Folding Beijing” can be used to write the Hamilton equation. However, when the system energy reaches its maximum or a stabilised state, the energy distribution across the three Spaces is extremely unequal. That is to say, the ultimate expansion of a megacity will eventually bring upon polarisation of population and class division, which is represented in “Folding Beijing.” This is the natural development of the system, on top of which human beings can make changes. Human intervention may reinforce class stratification by exploiting the poor, or mitigate the status quo by attending to the poor, but there will never be complete equality. What we can concentrate on is increasing fair opportunities for all. EZ: Speaking of fair opportunities, the affective choices of characters in “Folding Beijing” are confined by their allocated social enclaves. Lao Dao’s mission is to deliver a love letter from Qin Tian in the Second Space to Yi Yan in the First Space. However, after discovering that Yi Yan is already married and considering his own economic situation, Lao Dao accepts more money from Yi Yan without exposing her lies. Yi Yan’s distorted martial values disclose the demand of marrying someone of an equal status. Within such a highly relegated social system, where do we place elements that cannot be rationalised, such as people’s affectivity and morality? For me, Lao Dao’s savior, Lao Ge, embodies the mobility and empathy that defies imposed class distinctions. HJF: For each character in the story, when it comes to making choices, they make a compromise between a righteous choice and a utilitarian one. If someone is under economic constraints, then he/she would probably make a similar decision to Lao Dao’s. Lao Dao’s choice does not concern justice or morality, because it is complicated to make a judgment about the love relationship between Yi Yan and Qin Tian. As a bystander, Lao Dao does not want to intervene. It is hard to tell right or wrong when it comes to love. Indeed, individuals’ affective choices are subject to various external influences. Everyone has a selfish side, but also a compassionate side. It is human nature to extend help and empathy to those in need. Qin Tian or Yi Yan would also assist others when the situation permits it. The problem is that, most of the time, when their own interests are threatened, the vast majority of people would choose self-protection. There is always hope and kindness in society but kindness alone is never enough. In many cases, our societal rules undermine people’s willingness or courage to exercise empathy so much so that benevolent behaviors do not guarantee good results. If reaching out to Lao Dao threatens his own job, Lao Ge would probably restrain from sympathising with him in the story. EZ: You have plans to expand “Folding Beijing” into a full-length novel. Will Lao Dao unite other waste workers and revolt against their subjugation? HJF: I am going to write a novel with “Folding Beijing” being the preface. The writing is scheduled from August 2018 to April 2019. When the majority of the population supports the current social structure, they feel that it is actually fair to give in a little in order to enjoy the benefits that society provides. As such the sustainability of social structures premises upon some people thriving from the sacrifice of others, so it is unlikely for any revolt or rebellion to happen. No. I will not finish the novel with any simple resolution such as a protest. It has to be much more poignant than that. EZ: Let’s talk about time and space. The 2017 Shanghai book fair is themed “Map and Territory: The World of SF.” The use of “map” and “territory” here is a deliberate gesture to rethink SF beyond a linear model of futuristic literature, and in terms of the imaginative exploration of possible space and transformations that time can provoke. Given that there is so much emphasis on temporal elements in SF, such as technological progress and utopian/dystopian futures, how do you usually approach the time-space dynamic in your writing? HJF: My understanding of time-space relationship is concurrent with the mainstream view within the science community, namely, time and space is limited but interrelated, and the laws of the universe determine our temporal-spatial thinking. Both time and space is very important to my writing. SF is not to mystify science. In my fiction, scientific or technological progress is not the essence, but the vehicle through which we explore borders of knowledge and possibilities of the future and the unknown. Sometimes our imagination of the future also prompts us to look to the present and reflect upon or rewrite the past. That said, a basic requirement of SF is its scientific accuracy. I can hypothesise on the basis of current scientific discoveries and inventions, but I will not wrap a story with fantasies or hypotheses that are discredited by science. For example, a number of novels in the Chinese book market theme around “chuan yue,” or time travel, in ways that are not backed up with any scientific logic. SF of this kind is not my thing. EZ: “Folding Beijing” engages with dystopian topics. What attracts you to write dystopian SF? HJF: I am not a dystopian writer and do not want to be defined as one. EZ: In “Folding Beijing,” there are many arresting details and a good command of literary and conversational language, which makes it an excellent story that combines SF and traditional literature. In what ways can SF benefit from traditional literary writing? HJF: I have never drawn a line between SF and traditional literature. Compared to traditional literature, SF creation has more freedom in terms of settings and plots, but SF needs to respect the narrative styles of traditional literature. SF can learn from traditional literature in terms of the excavation of human nature, the setting up of conflicts and suspense in the story, in-depth portrayal of human psychology and conversations, the artistic and aesthetic modifications of mainstream literature, etc. As for stylistic tactics, it depends upon the preferences of individual authors. The criteria against which we judge a classical novel also apply to SF, including the vividness of characters, the completeness of a story, and the strength of thematic expressions, and so on. By these criteria, I do not mean specific rhetorical strategies, such as how to depict a moon, which constitutes only the surface of a novel. I mean the in-depth aesthetic properties that are embodied in a novel’s theme, structure, and characterisation. These properties are what a SF writer needs to learn from traditional literary writing. EZ: From your experience, what challenges does Chinese science fiction face? HJF: My understanding is that there is still a lack of classical, groundbreaking works in Chinese SF. The main distribution platform for Chinese SF is magazines, and even though there are now some online columns and WeChat public accounts that start to publish SF, these channels are suitable for publishing short-length stories. There is an insufficient number of full-length novels such as Liu Cixin’s The Three-Body Problem. On top of this is the declining readership that does not respond favorably to some SF novels, even those full-length novels written by Han Song and Jiang Bo. The market for genre fiction is thus quite specific and narrow. It then becomes very challenging for new writers to get published or assert a place. Other ways of motivating the market can help, such as successful film adaptations. Personally, I think it would be helpful if publishers and the media could promote more SF works and present more SF writers to the public audience. The development of SF in China is certainly a slow and gradual process. EZ: A pertinent issue “Folding Beijing” engages with is the relationship between humans and machines. How is this addressed in your new short story collection, AI: The Mirror of Man? HJF: The six short stories in my new book all touch on human nature. The era of artificial intelligence enables us to gain a better understanding of human nature. In the process of configuring the differences between human beings and artificial intelligence, and the different methods of thinking between humans and machines, we can acquire a deeper knowledge of ourselves. This process allows us to detect and cherish those precious qualities within humanity that have been neglected, such as compassion and empathy for others, self-awareness, free will, interpersonal communications, and so on and so forth. We often see these qualities in children’s curious eyes and their sincerity. EZ: Thank you Jingfang, for your valuable insights into “Folding Beijing” and Chinese SF. Emily Yu Zong has a PhD in English Literature from the University of Queensland, where she remains an honorary research fellow. Her doctoral thesis on Asian Australian and Asian American women writers was awarded the 2016 UQ Dean’s Award for Outstanding Higher Degree by Research Theses. Her research interests include ethnic Asian literature, gender and sexuality, and literature and the environment. She has published academic articles, interviews, and book reviews in Journal of Intercultural Studies, JASAL, New Scholar, Mascara Literary Review, and Australian Women’s Book Review. A.J. 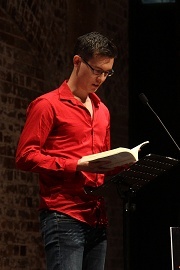 Carruthers is an Australian-born experimental poet, literary critic and lecturer in the Australian Studies Centre at SUIBE in Shanghai. He is author of Stave Sightings: Notational Experiments in North American Long Poems, 1961-2011 (Palgrave 2017), a book of literary criticism that examines five North American long poems and their relation to musical structures and musical scores. The first volume of his epic poem, AXIS Book 1: Areal, was published in 2014 (Vagabond). Opus 16 on Tehching Hsieh is a downloadable eBook from Gauss PDF. The EvFL stanzas are intuitive works inspired by the prosodic dissonances of Elsa von Freytag-Loringhoven. – ojé Onto ojé, Orkm O Ojombe space! | necessity our Glossgreen Praise: Dappled Śulphur Face.